Where did the time go? I know I registered Nicole for Kindergarten, but it still felt so far away. Now there’s just a summer left to go. 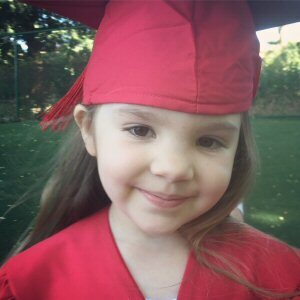 Yesterday was Nicole’s preschool graduation. Domingo left work early so we could get a good parking spot, which also meant a front row spot to watch Nicole walk across the stage in her little cap and gown to shake the program director’s hand and get her certificate. Alexis enjoyed bopping to the music and dancing next to her seat while we waited for the ceremony to start. As soon as she spotted the big kids lining up, however, she wanted to run over and join them. (Now that her class spends time with Nicole’s, she gotten used to tagging along with big sister.) We told her the procession was for the kids going to kindergarten, and she insisted “I go Kindergarten too”. All too soon, I’m afraid. All to soon. After the ceremony Nicole’s teacher had a surprise for all the parents. She had painstakingly filled hardbound yearbooks with photos, drawings and notes written by the kids. Nicole wrote that she wants to be an astronaut when she grows up, her favorite food is grapes, and what she’s most looking forward to in kindergarten is playing with her friends. Nicole wanted to hold onto her yearbook herself during the party, but I clung to it like Gollum holding the precious. Her teacher’s creativity didn’t stop there. She also had a keepsake designed for the kids, to remind them of their time at preschool and of each other. Each child received a white t-shirt, autographed with the hand prints of all the kids in the class. They wore their special graduation t-shirts under the gowns for the ceremony. There were also cupcakes topped with graduation rings and gift bags from the teachers with notebooks, pencils and a ruler. Needless to say the kids had a great time. The party may be over, but we’re not done celebrating yet. Mommy and Daddy also had a special treat planned for our mini graduand and her shadow. Nicole, you just graduated preschool, what are you going to do next?